Lake Macquarie & the NSW Hunter Valley. Polar Pools inspires everyday living by seamlessly integrating your home with swimming pool and outdoor entertaining areas. Spanning two generations and nearly five decades, this family owned and operated company combines respected industry experience with design innovation and construction expertise. 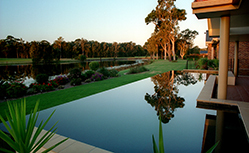 Specialising in all styles of domestic and commercial swimming pools, outdoor rooms, architectural landscaping and stunning leisure spaces, Polar Pools is one of the most respected names in the Australian swimming pool industry. Find out what separates us from the pack - and inspires our clients to spend more time outside in summer while increasing their living space in winter - with this stunning photo gallery of our swimming pool concepts. A qualified landscape designer will help you create a seamless transition between indoor living areas and outdoor entertaining spaces around the swimming pool.